Conversely, employees who participate in a structured onboarding program are projected to stay with that employer for at least three years. Consider your Millennial workforce who are often known as the “job-hopping” generation. If you could find a way to engage them and connect their hearts to your organization, wouldn’t you want to? Employees who have an extensive onboarding experience are also more likely to become productive team players and willing brand ambassadors. Employees are also expecting a richer, more consumer-driven experience from their employers. While the benefits of onboarding are clear, just 12 percent of employees agreed that their company did a good job with employee onboarding. However, onboarding isn’t just a nice thing to do. It’s a critical component in creating and maintaining a healthy workplace culture. Creating a culture that permits team members to thrive doesn’t occur automatically, nor does it occur without effort. It takes work and focus to embed it in the day to day operations. When part of an overall people strategy, onboarding connects the company’s mission, vision, and strategy with the cultural context and the job-specific elements. Sixty-seven percent of high performing companies have a structured new-hire onboarding process. 1. Understand the Difference Between Onboarding and Orientation. It may be tempting to confuse orientation with onboarding but the two are different. Orientation is an event. Onboarding is a journey. While orientation might cover history, company policies, benefits, and job-specific training, onboarding is much broader. Onboarding is about getting your new employees, and even their families, excited about your company. In addition to sharing videos and (nonproprietary) reading material before Day 1, take the opportunity to send company swag. Let them sport a new polo or cap or whatever and get excited. We all love presents. 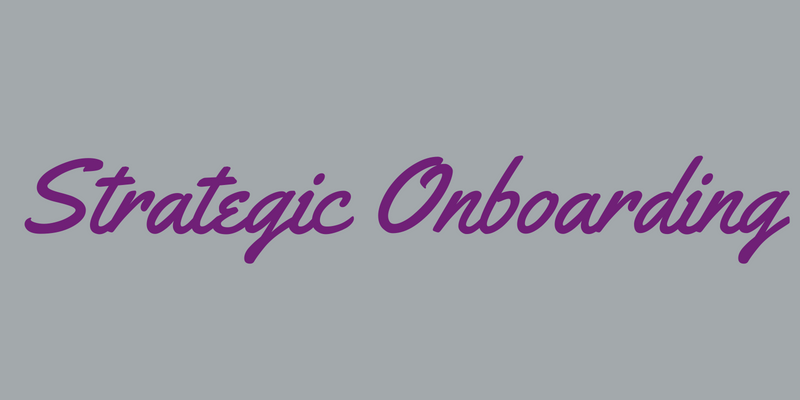 Strategic onboarding is a company-wide endeavor facilitated by the HR department. Onboarding views employees as potential brand ambassadors and equips them with the information to advocate on the company’s behalf, often even before they start employment. 2. Include the CEO and Company leadership. Company leadership should have meaningful involvement with new hires, no matter the size of the company. New hires should have access to company leadership, so they understand how their unique role supports the organizational mission. Hearing stories about the purpose of the company and the customer experience they desire are incredibly compelling when coming directly from leadership. The CEO, founders and/or leadership, can send a convincing message to reinforce that the organization values its talent. As examples, Netflix’s CEO meets new hires in a casual setting and Twitter’s CEO has breakfast with new hires. He likely understands that onboarding is about helping new hires cultivate relationships with colleagues right out of the gate. When companies do this, they create teams that can bolster employees and clear hurdles that a manager may or may not see. Transitioning into new work environments can be difficult. It takes a village to support new hire onboarding by ensuring their integration into the company. This can be done by inviting new employees to happy hours and company events, publicizing affinity groups, establishing a “Brown Bag Lunch & Learn” series, or identifying other opportunities to help new team members connect with their colleagues. The onboarding team can also identify opportunities for departments to share their work, goals or interests with newer team members. Some companies have created physical spaces in the office where employees can step away and socialize for a few minutes throughout the day. When team members feel connected to their work and their colleagues, they’re more likely to be engaged and their need to belong is met. At CGI, cultural integration is so important that each year, several hundred new leaders are invited to headquarters in Montreal to meet with and learn from its C-suite and other leaders. It’s part of the ongoing process to onboard employees, ensure cultural alignment and a strong connection to the company’s vision and purpose. 4. Assign a Coach or Buddy. Further drive and embed cultural integration and support by assigning a buddy to meet with new employee on regular basis to help them better understand the lay of the land, prepare for meetings with the manager and ensure the new hire doesn’t get lost understanding the cultural mores and norms. Buddies can serve as a great sounding board for what the new employee is hearing, experiencing and feeling and can help them navigate the unwritten rules that often torpedo a person’s career. And, hopefully, a friendship develops as well. There are many technology solutions that allow you to engage and stay connected with your new hire, even before they officially come on board. And, knowing what we know about Gen Z’s who are digital natives, companies should look to leverage technology as much as possible. I would recommend creating digital content to cover information that doesn’t need to be delivered face-to-face (for example, departmental overviews, company policies, technical skills training). Not only will this free up staff’s time for more valuable face-to-face interactions, but it allows the new employee to go back and reference the information as needed. While many organizations recognize the value of providing orientation for new employees, more could embrace the advantages of holistic onboarding. We know organizations with carefully thought-out onboarding programs experience a 60 percent improvement in revenue per full-time employee, a 63 percent improvement in customer satisfaction and a 50 percent higher retention rate. We see the benefits, so let’s commit to developing a strategy that onboards new employees the right way. Shaara Roman is founder and managing partner of the Silverene Group, a boutique firm that consults with organizations to help them create amazing workplaces. The company supports leaders as they build engaging cultures. Follow the Silverene Group on Twitter at @silverenegroup. This article was originally published on SHRM Executive Network – HR People + Strategy. Read more here.